Specially engineered for adaptability, the DSP-15 may be the only loop detector you ever need. Designed to work with in-ground inductive loops from 20 to 2000 uH. The DSP-15 vehicle detector has been specifically designed to handle all parking, drive-through and access control applications. Working on virtually any size loop, the DSP-15 automatically tunes itself to the best operating frequency within the selected range. 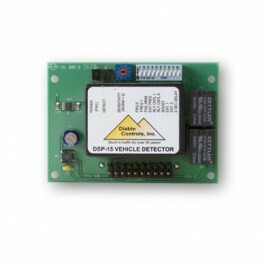 Environmental conditions are constantly compensated with the DSP-15’s HYPERTRACK software. The DSP-15’s inherent noise filtering algorithms allow it to work reliably in any electrical situation. It can be used as either a safety loop or free exit loop detector. With the flexibility to be either “fail safe” or “fail secure,” it is the only parking detector you will ever need. Loop Size: Works on any in-ground inductive loop from 20 to 1000 mH. Output A - Main detection output which can be modified by delay and extension. Fail safe or fail secure operation changeable by PCB jumper.NOTE: Units are shipped in the Fail Safe mode. Loop Failure: If the loop fails, opens or shorts, the power indicator flashes. Output B can also indicate this condition if desired (see above). The option to “remember” an intermittent loop failure is also provided. Sensitivity: Experience has shown that almost all parking and access control applications can be handled with sensitivity set at NORMAL (level 5). The rotary sensitivity switch is rarely moved from NORMAL. However, the DSP- 15 has ten sensitivity settings varying from LOW (level 0) to HIGH (level 9).